I have been travelling almost non-stop for a month now, visiting with thought leaders across the country and talking with them about the concept of trust in health care. My sometimes traveling companion Dr. Richard Baron and I have had multiple discussions with others around the dimensions of trust, including competency, integrity and trustworthiness. 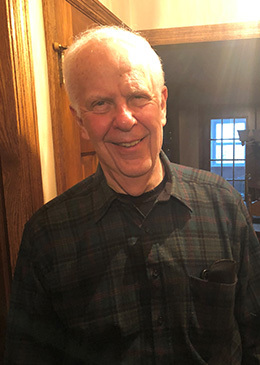 During a recent trip to Madison, Wisconsin, on a cold, February afternoon, I went to visit author Parker Palmer, founder of the Center for Courage & Renewal, at his home. Mr. Palmer has been an inspiration to me for almost two decades now—the Foundation’s annual Forum attempts to honor his ideas around the importance of creating a “safe space” and listening deeply and respectfully to each other in collaboration. In two chairs facing each other in front of a fire, we had a delightful and thought-provoking conversation. Parker and I talked about trust and its many definitions, and quickly arrived at the subject of making safe spaces at work and why they are important. In safe spaces, a person is allowed to be their best and—in Parker’s words—most “authentic self.” These safe spaces need to be created through a “professional covenant,” he told me, meaning there needs to be a common definition around ways to respectfully interact with one another. While most of us refer to this as setting ground rules, Parker believes that referring to it as a “professional covenant” augments its importance and significance. Another part of our conversation centered around ways to create a social movement (i.e. Choosing Wisely) and how to determine if it has had an impact. Individuals can no longer tolerate a “divided self” (i.e., knowing change is needed and doing nothing to change it) and decide to take action. Individuals with congruent values seek one another out and develop a community with shared goals. The community goes public, is accepting of criticism and makes necessary adjustments. Success is achieved when rewards and punishments are changed to align with the movement’s goals. The last phase of a movement—changes in rewards and punishment—really struck me. With Choosing Wisely in my thoughts, I immediately thought about financial rewards but Parker emphasized the intrinsic reward of being in a place where your “authentic self” could emerge. Is there a more authentic physician than one who gives their patient the right care they need, one that eliminates unnecessary services, without the need for financial rewards? It reinforced our thinking about Choosing Wisely as a movement that inspires physicians to take action in order to bring their work more in line with their “authentic selves” and recommit to their professional values. I certainly left Parker’s home inspired but the real highlight of our conversation was spending time with Parker himself. It was a delight being in the presence of an authentic person; one as generous, insightful and caring as he is. Parker’s realism about individuals’ failures and vulnerabilities makes him even more human and endearing. He has had a major impact on how I thought about building relational trust for the Choosing Wisely campaign and in all of my personal and professional relationships, and for that I am truly grateful.